..and here's what it looks like after my daughter has eaten most of it. I wasn't really paying attention and so she's been going through this one before I remembered to sample it properly. So, we're going to keep this simple. 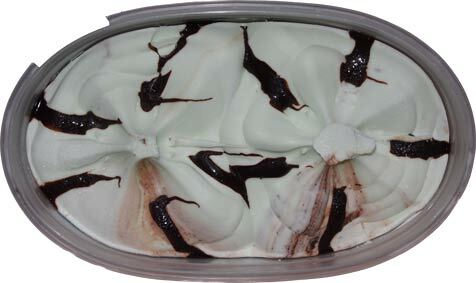 First impression is that this is a fun mix of chocolate sauce and mint with neither one overpowering the other. It's typical Blue Bunny texture with plenty of sauce to go around (at least at the bottom here!). 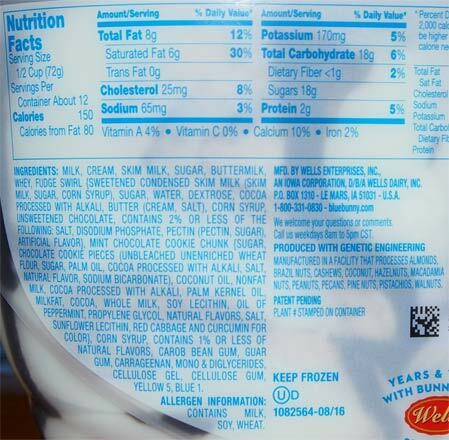 You may have noticed above that there are no typical cookies & cream crumbs in this one. Repeat, this is not some mint C&C flavor. The real star of this ice cream is the cookie crunch because it's basically these very cool little candy balls. It's a crunchy chocolate cookie center, covered in mint, and then covered in chocolate. I'm pretty sure you could just sell these all by themselves. That's it for now. 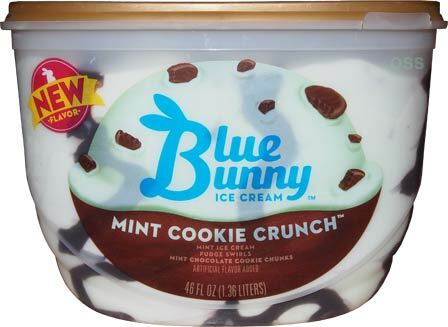 If you like mint ice creams, definitely try this one so you can get to the cookie crunch bits. Neat trick Blue Bunny. I really like this flavor. 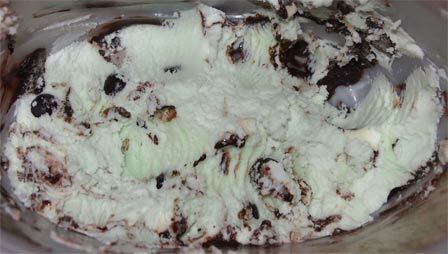 It's not the best mint ice cream out there, but it's quite good for the price point. The mint cookie balls make it unique - they remind me of the mint cookie balls in the chocolate mint ice cream that Ben and Jerry's recently discontinued (sad, as that was one of my favorite BJ flavors). I haven't tried this one yet, but the PB And Cones is really good! I love the pb swirl, it tastes like a pb mousse. The choc dipped cone pieces are also tasty! We really enjoyed this flavor at my house. My kids picked out the mint cookie balls as they ate their ice cream to enjoy them as a stand-alone. They counted to see who got the most! I liked the chocolate swirl which was ample. Nice new addition.